It's time for another SUPER FUN challenge at The Kraft Journal, and this week we are celebrating our freedom. We live in the most amazing country in the world, and I'm SO very grateful for all the men and women who fight, and have fought, to defend the freedoms we enjoy in America. Our family loves to celebrate the 4th of July, and this card is all about celebrating that very special day. As we celebrate Patriotism with our "Let Freedom Ring" Challenge this week, I wanted to create a card to celebrate this great country...The United States of America. I started with a Small Lunch Bag Kraft Note Card to which I added some red, white and blue colored card stocks. I die-cut the letters (USA) and attached some buttons with Red Baker's Twine. The Kraft Journal has so many great products to help you create something special for this week's challenge, and we really hope that you will play along with us. Craftin' Desert Divas Linky Party - 4th of July/Canada Day - I'm sharing this patriotic card to celebrate our Independence Day! Brilliant card Karen! I love the Red White & Blue on Kraft! Thank you so much - Karen I am already a follower of your blog. Such a beautiful card thanks for sharing!!! Great patriotic card, I always love red, white and blue with kraft. oh how pretty! Love these colors with kraft very classic and pretty! Such a beautiful patriotic card!!! Love red, white and blue on kraft paper!! Thank you for joining us at Craftin Desert Diva's Linky Party!! Such a stunning card! I really like the bold colors and shapes and those buttons are great in the center of the stars. See, you can really rock the CAS! Karen this wonderful! 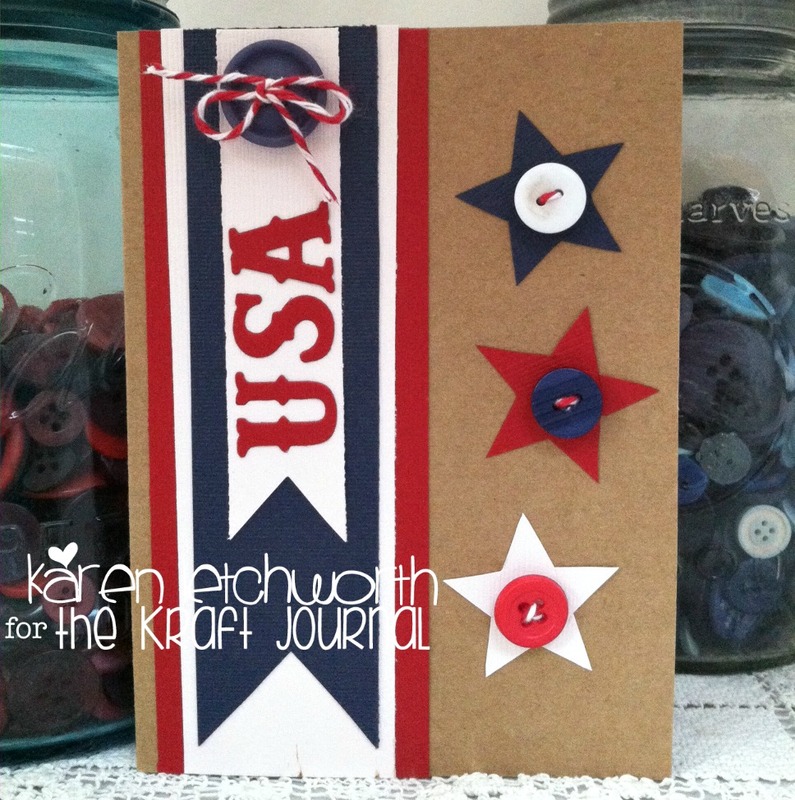 I love the red white & blue on kraft cardstock! Such a great idea!! Thanks for linking up with us at Craftin Desert Divas! Have a wonderful day!! Beautiful project! Way to go on incorporating the patriotic colors! Thank so much for joining us at Craftin Desert Divas. Hope to see you on our next linky party!! Absolutely wonderful card for 4th of July, Karen! Love the flags, stars, buttons--everything! Looks great! Elegant and classy!